Ammerhurst Limited has been established for over 30 years and is an accredited member of the Guild of Keycutters within the Master Locksmiths Association. Ammerhurst was originally conceived as a solution for a locker company's after sales service problem. They had sold the lockers and inevitably customers would lose their locker keys and need replacements, often as a matter of urgency. The company wanted to provide a good after sales service but it was geared up to supply large quantities of lockers, not a few replacement keys from a potential choice of thousands of different key numbers. 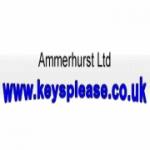 Instead of trying to solve the problem themselves the locker company would simply put the customer in touch with Ammerhurst who were set up specifically to supply the relevant keys quickly and efficiently. Ammerhurst offer a comprehensive and efficient service in the following areas - locksmiths, replacement keys , replacement locks, access control, electronic lock systems and security door locks just to name a few. If you have lost your keys for any type of furniture ordering replacement keys couldn't be easier. For most locks the code number of your key is stamped on the face of the lock so you can simply make a note of the code and order the keys from our web site. If you need new locks, lockers, desk pedestals, filing cabinets or any type of office accessories then simply click below to enter our site. They turned up an hour late, this was after I called them to complain. Was told they&rsquo;d assess the job, let me know what was wrong then let me shop around. This never happened! Instead they charged me &pound;250 for a temporary lock which doesn&rsquo;t work properly and poor quality. He tried to force me to pay a &pound;150 deposit for a part he did not know the price for. If I were a vulnerable person, I&rsquo;d probably be completely out of pocket. AVOID THEM!!! This company is great! I've just made my third order from them. The need the minimum information to get you the key that you need. My first order was for keys of seven cupboards that I bought second hand. I just gave them the numbers on the locks. It was even cheaper than it would cost me to cut duplicate keys.